Reconstruction signifies a monumental societal shift in American History. Following the Civil War, there was great uncertainty as to how to treat the conquered south and the recently freed slaves. All hopes of a forgiving peace were dashed with the assassination of Abraham Lincoln, leaving the initial Reconstruction effort in the hands of his successor, Andrew Johnson. Johnson followed his own plan for Reconstruction, attempting to overcome opposition from his own political party and alienating many in congress with his leniency towards former confederate leaders and the South. After Johnson's impeachment, Congress then ran a radical plan of Reconstruction. While many think that Reconstruction focused mainly on the former slaves, party politics and disparate visions for the country’s future clouded and complicated this era of reform. 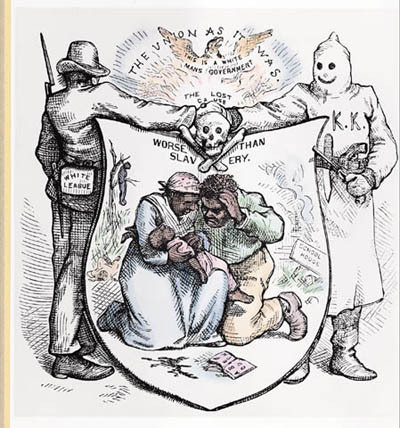 Despite the huge opportunity to revolutionize the social system of the United States through agencies such as the Freedmen's Bureau, many of the former slaves were reduced to a new form of economic slavery and political oppression as demonstrated by groups such as the Ku Klux Klan. This period is a significant transition in American History. It marks the end of slavery and then transition to a market driven industrial society. However, African Americans continued to suffer inequality and discrimination over the next century, marked by segregation, disenfranchisement and poverty. Students will analyze multiple sources to write an extended response evaluating the effectiveness of the federal government's attempts to utilize the Freedmen's Bureau to implement and enforce the "Reconstruction Amendments" in the south between the years of 1865-1877. Lesson Sequence 4 "Reconstructing a National Culture"
The goals of Reconstruction were to readmit states to the Union, create new political systems, rebuild the economy, and expand and protect the rights of African Americans. The 13th, 14th, and 15th Amendments extended new rights to African Americans and increased political participation at local, state, and national levels. The Freedmen's Bureau supported the development of a free black culture by building schools, hospitals, providing social services, and advocating for equality. Many freedmen became tenant farmers and sharecroppers, but unfair labor contracts, poor soil, and the inability to own land kept most in deep poverty. The Ku Klux Klan used terrorism to deny African Americans their rights, including the right to vote, own property, and attend school. The disputed election of 1876 was resolved when Hayes promised to end Reconstruction and provide economic aid to the South in return for southern votes. After federal troops were withdrawn from the South, states worked to limit the rights of African Americans. Initially the teacher must review with students that during Reconstruction, African Americans needed protection from states and individuals and that three amendments (13th, 14th and 15th) were ratified to provide that protection. The students should be aware and understand why African Americans needed such protections following the Civil War. The teacher should review the concept of due process of law. Explain that even though the Fourteenth Amendment said that states could not abridge privileges of citizens or deny due process, and that each due process right had to be incorporated separately through court decisions. One such case that most students should be familiar with is Brown v. Board of Education. The Supreme Court decision in this case was based on the 14th Amendment and that "separate but equal" was inherently unequal. This was supported by the equal protection clause of the 14th Amendment. After modeling this use of a primary source, students will then work in pairs to read and analyze the documents (noted in the Materials section above). As the students read and analyze the different documents, they will complete a graphic organizer that will assist them with determining the reliability of the sources. There are several ways to differentiate this lesson. One way is to reduce or increase the number of documents that are to be reviewed from. In addition, many of the written documents could be replaced by political cartoons from the era (Harper's Weekly is a great source for this). At the conclusion of the lesson, students are expected to submit an Extended Constructed Response (multi-paragraph essay) on the effectiveness of the Freedmen's Bureau during Reconstruction. Download the essay assignment and rubric here. "Section 1. Neither slavery nor involuntary servitude, except as a punishment for crime whereof the party shall have been duly convicted, shall exist within the United States, or any place subject to their jurisdiction..."
"Section 1. All persons born or naturalized in the United States, and subject to the jurisdiction thereof, are citizens of the United States and of the State wherein they reside. No State shall make or enforce any law which shall abridge the privileges or immunities of citizens of the United States; nor shall any State deprive any person of life, liberty, or property, without due process of law; nor deny to any person within its jurisdiction the equal protection of the laws..."
"Section 1. The right of citizens of the United States to vote shall not be denied or abridged by the United States or by any State on account of race, color, or previous condition of servitude..."
Issues of Violence brought before the Freedmen’s Bureau. "Abraham Wallace (col'd). . . . complaines that a man . . . . discharged a loaded pistol three time & exploded a cap the fourth time at his wife," Thomas P. Jackson November 9, 1867. Various records relating to murders and outrages against freedmen in Louisiana from 1865-1867. PBS American Experience, "Laws Fail to Protect Us"
Increased violence against them as the fall 1867 election approached caused the African American citizens of Georgia to request protection from federal troops. An excerpt from Dorothy Sterling, ed., Trouble They Seen: The Story of Reconstruction in the Word of African Americans. New York: Da Capo Press, 1994. The experiences of an agent of the Freedmen’s Bureau are detailed here. Excerpted from Marshall Harvey Twitchell, Carpetbagger from Vermont: The Autobiography of Marshall Harvey Twitchell. Baton Rouge: Louisiana State University Press: Baton Rouge, 1989. A freed slave describes the violence he lived through after Emancipation. Excerpt from Senate Report 693, 46th Congress, 2nd Session (1880). Reprinted in Dorothy Sterling, editor, The Trouble They Seen: The Story of Reconstruction in the Words of African Americans. New York: Da Capo Press, 1994. PBS American Experience, "The First-Class Men of Our Town"
A black legislator testifies about the white men who beat him nearly to death in 1872. Excerpt from Testimony Taken by the Joint Select Committee to Inquire into the Condition of Affairs in the Late Insurrectionary States (Washington, 1872), printed in Dorothy Sterling, ed., Trouble They Seen: The Story of Reconstruction in the Words of African Americans. New York: Da Capo Press, 1994. Joint Resolution of the Maryland House of Delegates Rejecting the 15th Amendment. Open using username aaco and password aaco#. Joint Resolution of the Maryland House of Delegates ratifying the 15th Amendment (in 1973!). Open using username aaco and password aaco#.